In December of 2007 there was a heavy ice storm that came through Gardner so I put on my winter gear and headed out to get some ice shots. I only had a two day window in which to shoot since warmer temperatures were in the forecast. I first went to the city lake where I found several big trees loaded with ice…simply beautiful! It was a challenge shooting in the very cold weather. My next stop was the local golf course. 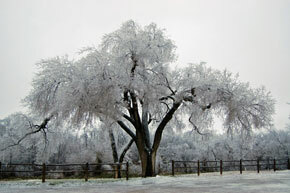 There were many different sized trees with ice and the frozen landscape was a winter wonderland. 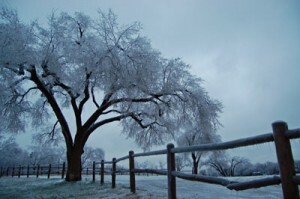 One of my ice photos from the golf course was featured on KSHB-TV 41 website…LRC weather predication page. The ice storm shoot was special because they don’t come around that often. Do you have poster prints of your artwork? I’d be very interested in knowing this & seeing a price list if you do. Your work is beautiful.